Difference Between Llama and Alpaca? 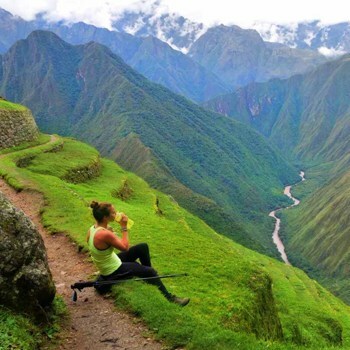 Peru is commonly associated with two things: Machu Picchu, and the Llama. This famous South American animal often features on postcards, and is seen as the typical image of Peru. But did you know that the country’s national animal, which features on both the coat of arms and the national flag is in fact, a Vicuña? A member of the camelid family, the Vicuña is a cousin of the Llama, as well as of the Alpaca, and the Guanaco. They all share one common ancestor. Often confused, before your trip to South America why not brush up on your camelid knowledge and impress the locals. (And if you’re already here, get reading!) Discover the difference between Llama, Alpaca, and their cousins. We’ve also included a guide to their different fibres, and useful info about buying Alpaca products. For someone who knows nothing about these animals, it can be impossible to tell the difference between Llama and Alpaca. Here’s a list of distinct features to look out for. 1. Look for the ears! The key in differentiating between these two species is by ear shape and length: Llamas have longer, curved, banana-like ears, whereas Alpacas have shorter, straighter, and more pointy ears. The Llama is about twice the size of the Alpaca. Llamas are heavier (200 to 350 lbs / 90 to 158 kg) and can even get to 400 pounds (181 kg), while Alpacas are normally 100 to 175 lbs (45 to 68 kg). In terms of height (measuring at the shoulder), Llamas are the taller species, at 42 to 46 inches (over 110 cm). Alpacas measure in at 34 to 36 inches (no more than 90 cm). Another way to identify your animal is by seeing just how fluffy it is! Whilst Llamas have a coarse outer coat (and a fine undercoat), Alpacas have finer hair, which is very dense and fast-growing. They even have fuzzy little faces! While this is less easy to tell from first glance, in general Llamas are more independent, and will protect themselves if needed. In fact, they often serve as guards for groups of other livestock, including Alpacas! More of a herd animal, the Alpaca also has a nervous disposition. Which leads to the question, do Alpacas spit? Only if you call them Llamas! (Joke…) As both the Llama and Alpaca are distant relations to the Camel, the answer is yes. However, this happens rarely, and normally under threatening conditions. The Llama is more disposed to this behaviour than the Alpaca. One thing both these species have in common is that they have both been domesticated for around 5000 years. 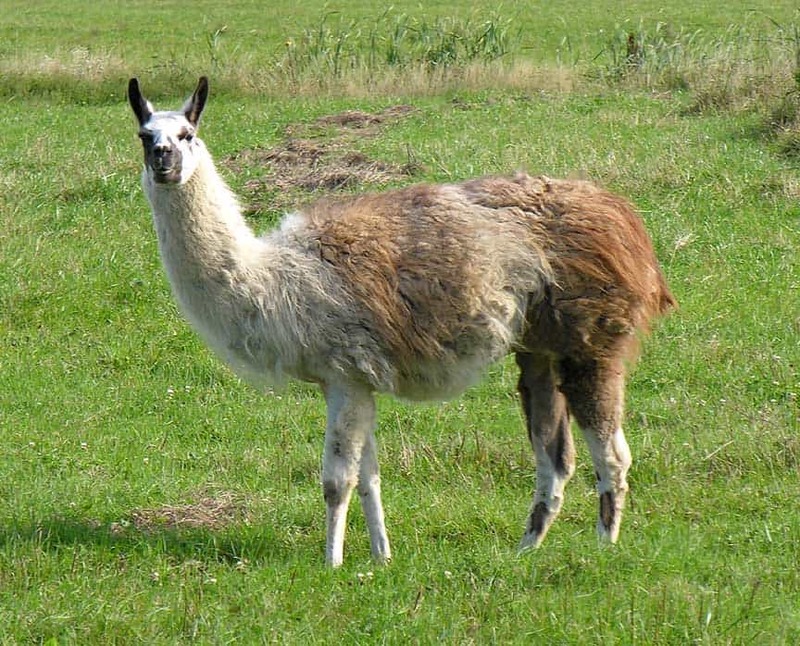 Since the Llama’s fur isn’t of the same quality as the Alpaca’s, it is more commonly used for meat. Being naturally bigger, the Llama is also bred as a pack-carrying animal. Did you know it can carry one quarter of its own weight? In fact, the Inca culture relied on Llamas to transport goods all around their Ancient Empire. In contrast, the smaller and woollier Alpaca is bred for the luxury fibre it produces. It has a uniform coat colour (whereas Llamas are patchier), meaning a specific colour can be bred. 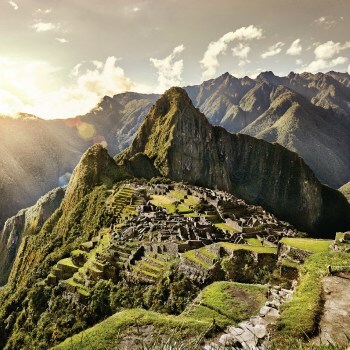 Head to the Andes Mountains to find the Llama, where the majority live in the high plateaus of Bolivia. It can also be seen in Argentina, Bolivia, Chile, and of course Peru. The Alpaca is primarily found in central and southern Peru, but can also be spotted in Chile, Ecuador, and Bolivia in the high Andes (Actually, the Alpaca – which originated in Peru – is found all over South America, as well as other parts of the world where they are kept on Alpaca farms.). 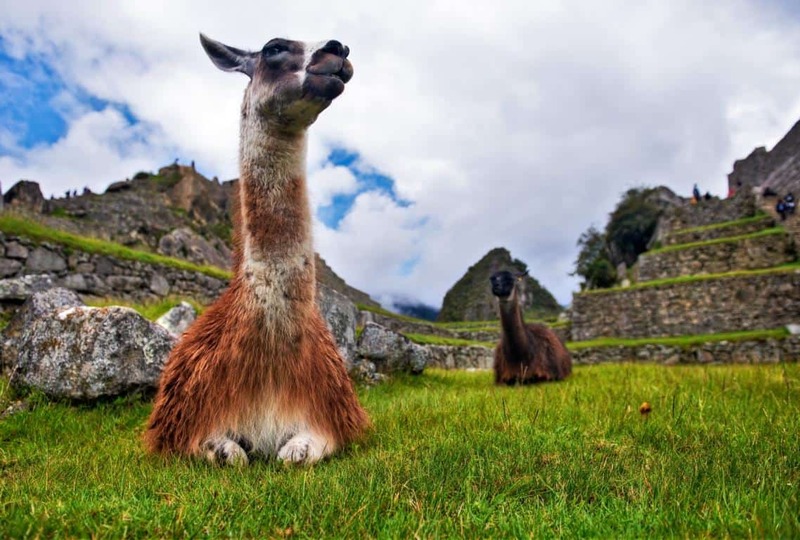 Llama’s can also be found at the historical ruins of Machu Picchu. The Llama’s here are incredibly photogenic and used to tourists, so you might end up with more Llama pictures than pictures of the actual site! There are two wild camelid species in South America you should know about: The Guanaco, and the Vicuña. It is believed that the Incas bred the Llama as a descendant of the undomesticated Guanaco, and the Alpaca as the progeny of the untamed Vicuña. The Guanacos and Vicuñas roam wild in the high alpine Andes, and you may well spot one – or both – of these varieties on your travels. The Vicuña is more closely related to the Alpaca. It is a small, slender, deer-like creature, weighing less than 150 lbs (68 kg), and measures 75 to 85 cm at the shoulder (no more than 33 inches). It is known for its super-soft fleece, and produces one of the most sought-after fibres in the world – although in a low quantity, at just one pound of wool per year (making the wool very hard to come by). However, this animal is in fact endangered. 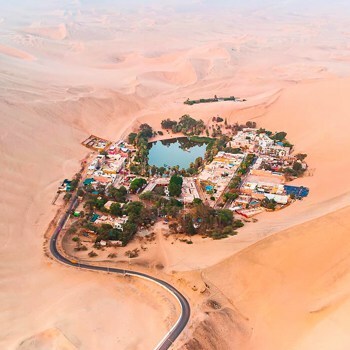 Once protected by the Incas, this changed when the Spanish invaded and took to hunting the Vicuña for its wool. Thankfully today, due to the extreme drop in numbers in the 1960s, it is prohibited to hunt the Vicuña. However, it is permitted to shear a certain number of these animals each year (releasing them after). 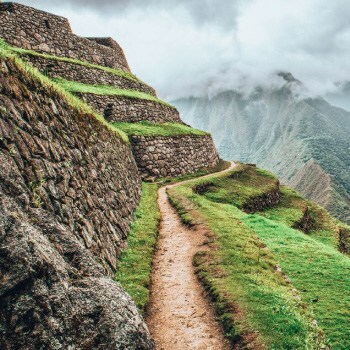 Where to find it: In the highlands of Peru. It can also be spotted in Bolivia, Ecuador, northern Argentina and northern Chile. The Guanaco is the smaller version of the Llama, and shares the same characteristics of coarse outer hair and a soft undercoat. Weighing in at 200 pounds (90 kg), it is larger than the Vicuña. It has distinctive colouring, with a brown back, a white underbelly, and a grey face. Llamas, on the other hand, come in a wider variety of colours. The Guanaco also has small, straight ears. 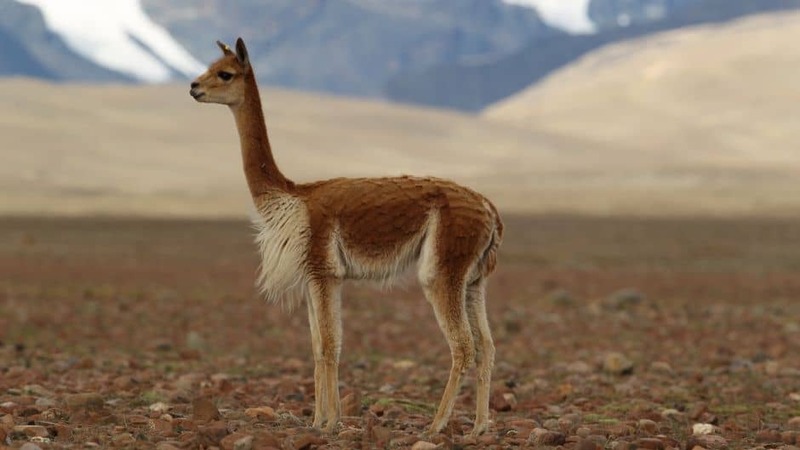 Like the Vicuña, the Guanaco is also protected, but as its upper coat is coarse, it has always been less desired, and so hasn’t experienced the same population struggle. 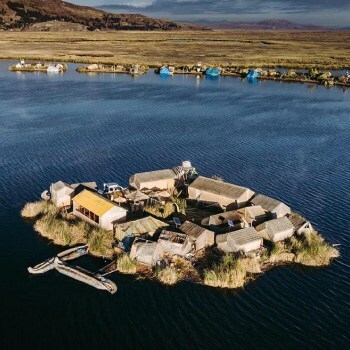 Where to find it: Go to Patagonia (Argentina). It can also be found in Ecuador, Colombia, Tierra del Fuego, and even the Atacama Desert. Guanacos can survive with little water, and at very high altitudes. When in doubt, go by size: Llama – Guanaco – Alpaca – Vicuña. The Llama is the biggest of the family and the vicuña the smallest. 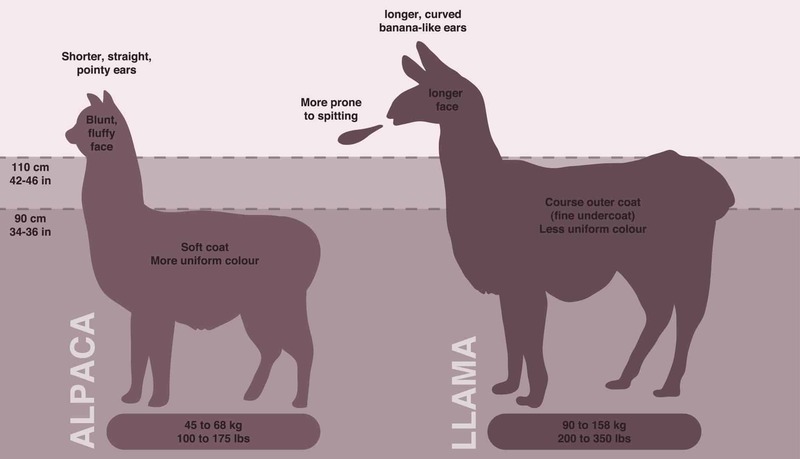 Check the colouring: Although Alpacas and Llamas both come in a variety of colours, the Alpaca’s coat tends to one uniform colour, whereas the Llama can have marked coat. The Guanaco has distinctive colouring, with a brown back, grey face, and white undersides. The Vicuña’s face is a yellow/reddish brown. Now you know your camelids, read on to learn more about the different fibre types, and for useful information on buying Alpaca products. Peru is home to 80% of the world’s Alpaca population. 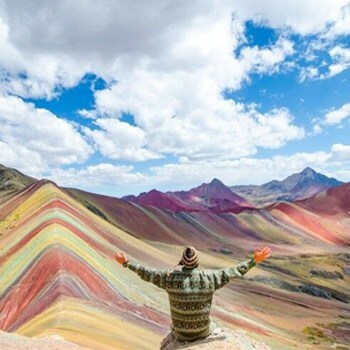 Their luxurious fibre is exported internationally, and the textile industry is one of Peru’s largest sectors. 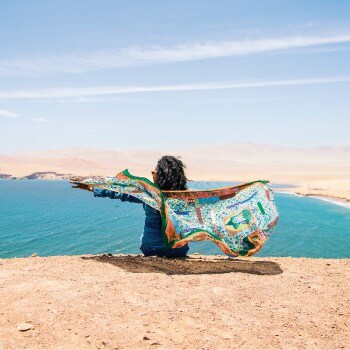 There’s no better place to get your hands on quality products than here in Peru, and your spending also benefits Andean communities who herd Alpaca for a living. Before splashing your cash, it’s a good idea to get your head around the different fibres, so you know which to go for. Note: The thickness of the fibre is measured in microns. Different brands use their own assessment, as there’s no official standard. The Llama has two coats, a soft billowy undercoat typically used for finer garments, and a protecting outer coat, coarse and thick, normally used for rugs, ropes, and wall hangings due to its rougher texture. 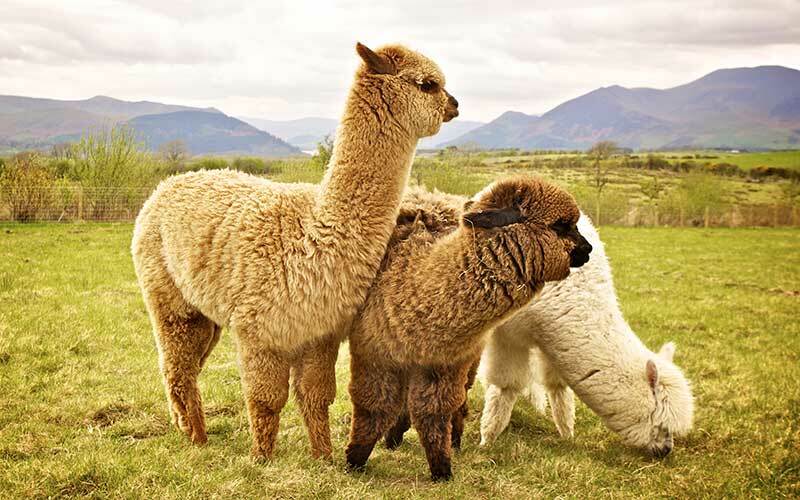 It is considered difficult to process Llama fibre due to the grand difference between the tough outer coat and fine undercoat, and the necessity to separate the finer fibres from the coarse upper hairs. 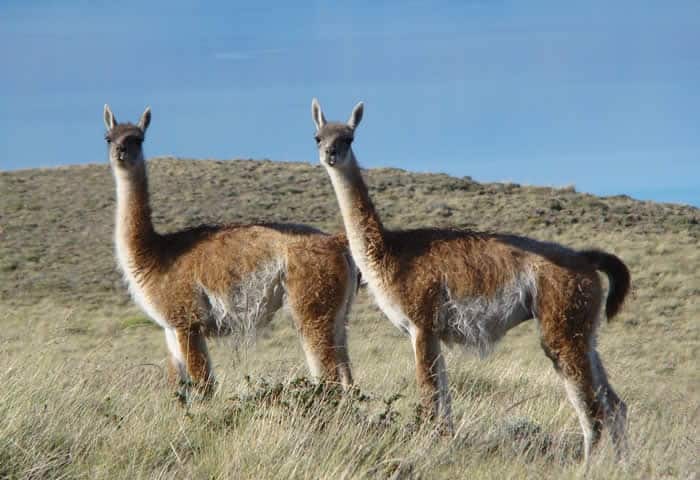 Guanaco fibre is considered as superior to Llama fibre as it is easier to process. The Guanaco also has two coats, with the light undercoat having a fine, downy fibre, typically a pale caramel colour. Which brings us to the Alpaca: It has a very dense and fast-growing fleece, which needs to be shorn in the summer due to the heat. The fibre produced is fine, strong, hard-wearing, soft, lightweight, luxurious, thermal, and hypo-allergenic. Baby Alpaca is a TYPE of Alpaca fibre – not as its name suggests, from a new-born baby Alpaca! This is taken from the first shearing, when the animal is less than one-year-old, from the underside of the neck and belly. Here the fleece is finest, lightest, and softest, measuring 21 to 23 microns in diameter (superfine Alpaca fibre’s diameter is 24 to 26 microns). Since Baby Alpaca fibre is so expensive, it is often blended with other fabric (ie. Sheep’s wool). Royal Baby Alpaca is a category of Baby Alpaca, with fibres measuring less than 20 microns. Vicuña fibre is considered as the best in the world: very fine, soft and of superior quality (with a matching price tag!). Indeed, in the ancient times, only Inca royalty could wear Vicuña, and they considered it a sacred animal. Today it is still a rare creature, and as it produces such little fibre, this makes the wool even more exclusive. In summary, the Vicuña and Alpaca are the two species which are most valued for their fibre: The Alpaca’s fibre is high in quality and quantity, and the Vicuña’s coat is very soft and of a superior standard. Bear in mind that Vicuña is the most expensive: it was after all considered fit for the Inca Emperor! Alpaca is more accessible, being specifically bred for this purpose. It is more prized for its fibre than the Llama, which has two coats, a rough one and a fine one, making processing (separating the fibres) tricky. This problem also applies to the Guanaco, although this species’ wool is considered more exclusive. 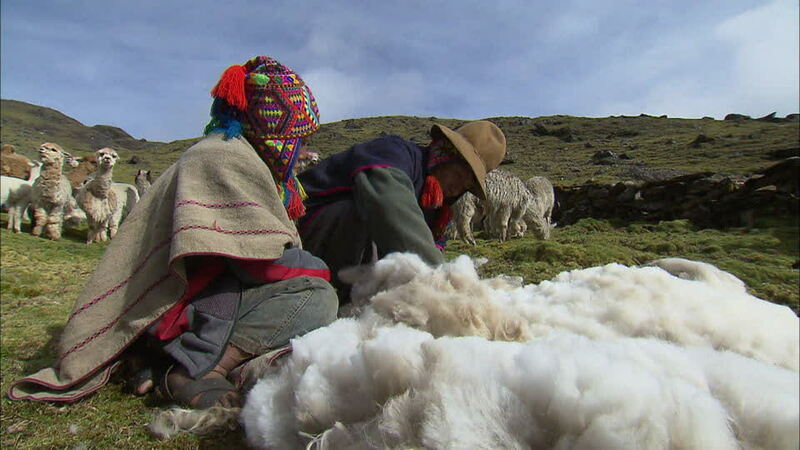 It is uncommon to come across products made of Guanaco fibre. Overall, the Alpaca fibre and products have many advantages, which are outlined below. Alpaca fibre is softer, lighter, and stronger than cashmere or sheep wool. It is lanolin-free, unlike sheep wool, meaning it holds less allergens, bacteria, and dust, and doesn’t feel prickly against the skin. There are over 22 natural colours, ranging from shades of white, grey, brown, and black. 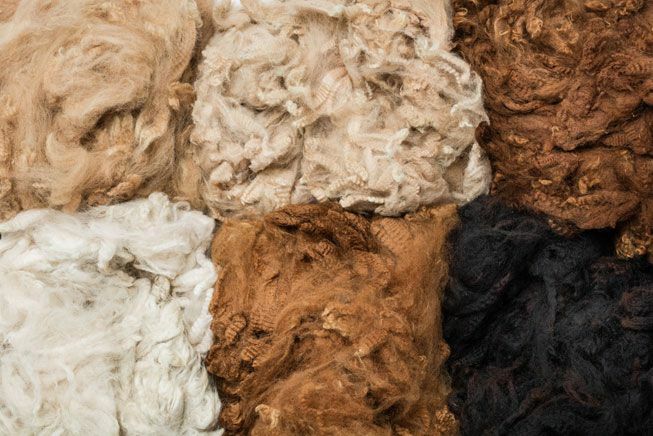 Alpaca fibre also has the advantage of being more ecologically sustainable when compared to cashmere: Not only does an Alpaca consume less water than a goat, it produces enough wool for four to five sweaters per year. In comparison, four goats are needed to produce enough wool for just one sweater per year! Everything you need to know about the Alpaca and Llama products you can find in Peru. Many clothing and accessory items, blankets, and even cuddly toys. The most popular items are sweaters and ponchos. They come in a variety of sizes, qualities and colours. They make great souvenirs to bring back home. Head to any Artisan Peruvian or Bolivian market and you’ll come across Llama and Alpaca products. 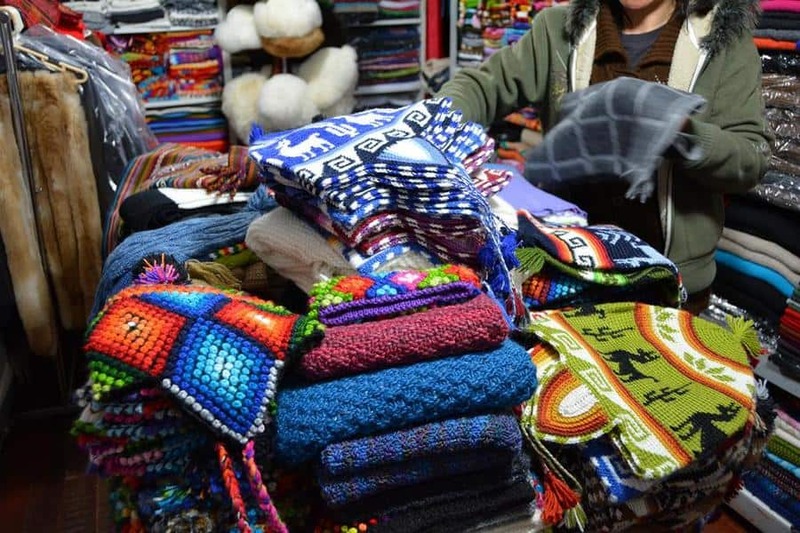 There is a market in Pisac (about one hour from Cusco) frequented by indigenous folk who sell their wares. If you’re in Lima, visit the Inka Market (Av. Petit Thouars). 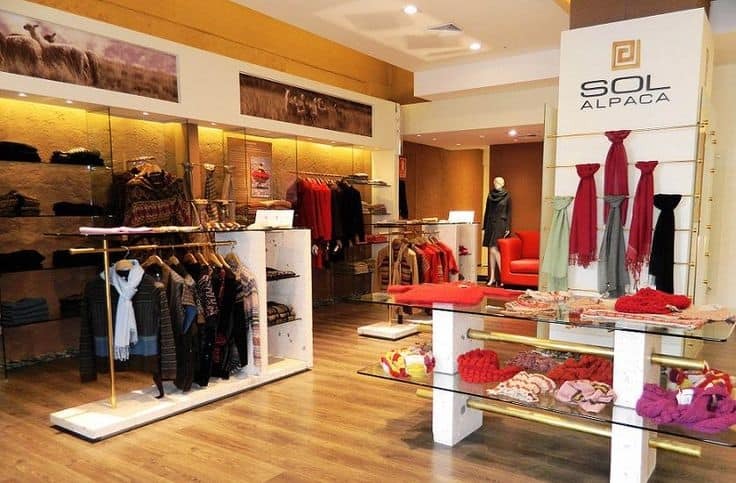 There are also luxury stores including Sol Alpaca and Kuna (check out their websites). Both have stores in the cities of Arequipa, Puno, Cusco, and Lima (including the Larcomar shopping centre and the airport). The products don’t come cheap, but buying from a store guarantees their quality. Look out for sales! For a blended Alpaca product (ie. not 100% pure), it will of course be cheaper. 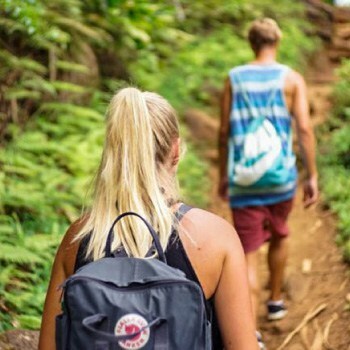 Look to pay from 10 USD upwards for scarfs and sweaters. A pure Alpaca sweater could be 60 to 80 USD (versus 200 USD approx. in Sol Alpaca or Kuna). A Baby Alpaca sweater will be at least 80 USD. Smaller items (hats, gloves, scarfs, socks etc) are cheaper. Bear shop prices in mind when you browse the markets. It’s worth going to Sol Alpaca or Kuna first to get a rough idea. Take a trip to the expensive stores, and just touch the fabric and products to know how they feel. Do this before going to markets, where the products are often marked as containing a higher percentage of Alpaca than they actually do. If you plan to save money and buy from a market, check carefully whether your item is mixed with wool or a synthetic material. Look at the product in the light – if you see coloured flecks or sparkles, it has got synthetic material. Alpaca should also be cool to touch, whereas synthetic products are warm. Baby/Royal Baby Alpaca items are more expensive, and are best for garments you’ll be wearing close to your skin, as they are super-soft and don’t irritate. Normal Alpaca is better for rugs/blankets as it’s more durable and insulating. Always shop around to compare prices and quality, and remember to bargain at the markets. 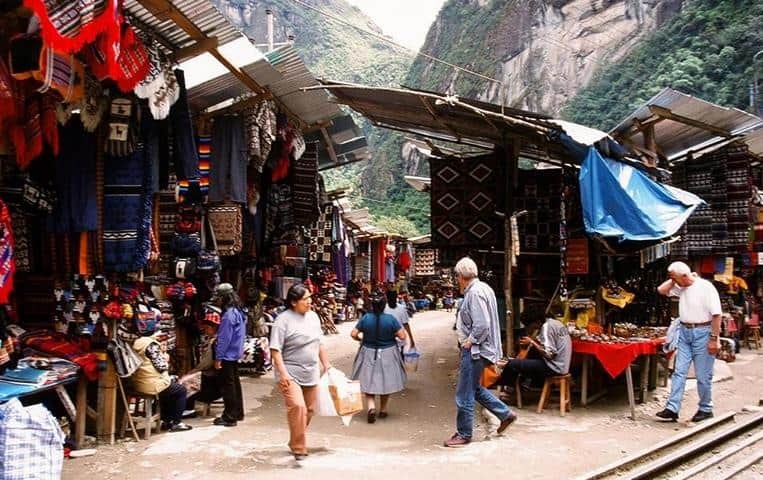 If you buy close to Aguas Calientes or Machu Picchu, expect higher prices, as these are typical tourist traps.